Phuket – 18 May 2018: – An award winning Phuket beach resort, JW Marriott Phuket Resort & Spa has added to its global reputation with its authentic Thai restaurant. Ginja Taste recently received the gastronomic award in an annual Thailand Tatler’s Best Restaurants 2018, the respected guide to the best of fine dining in Thailand and reliable source for Thailand’s food lovers. 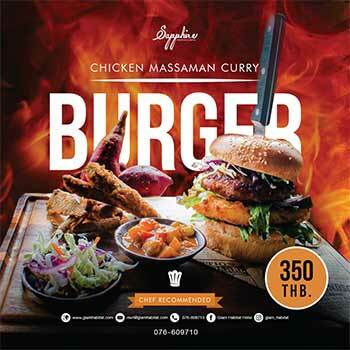 Now in its 17th year, for the 2018 edition 234 premier dining outlets across the country – 150 in Bangkok and 84 upcountry – were reviewed anonymously and scored in four key categories: food, setting, drinks and service. Ginja Taste was scored 83 out of 100.
includes Pu Nim Nam Makham – softshell crabs with tamarind sauce; Moo Hong Som – stewed pork with cinnamon, ginger and lychee; Gaeng Lueang Pla Pak Tai Sapparod – Southern sour fish curry with Phuket pineapple just to name a few. Ginja Taste set in a traditional sala, the Thai restaurant is surrounded by tropical gardens and boasts a stunning view of the Andaman Sea. Relish a flawless blend of creative culinary techniques, authentic flavours and warm Thai hospitality. It is one of 10 restaurants and bars at JW Marriott Phuket Resort & Spa and overseen by Executive Chef Dietmar Spitzer alongside with Libor Secka, Director of Food & Beverage. ← Clean the Beach Boot Camp (CBBC) celebrate its 5 year anniversary with Kata Sea Breeze Resort.